There are a lot of dog training whistles on the market today and they all have a wide variety of features and price points. Here at JugDog we have compiled a lot of the best dog whistles to help you make an informed choice on which one is the best for you and your dogs needs and budgets. What is a dog whistle for? What is a good frequency for a dog whistle? What should I look for in a dog whistle? The Mudder dog training whistle is one of the best out there. It’s light and because it comes with a lanyard it’s very convenient to carry around. It has an adjustable frequency to tap into what suits your dog (not all dogs hear the same whistle frequency). This is a fantastic whistle if you have many dogs or don’t want to waste time buying single frequency one just to find out your dog can’t hear a thing. The cons? There aren’t many however the sticking point is that it is actually audible to humans but by no means it is loud. May not be ideal at 2am. Although most dog whistles are cheap, the Ancol dog whistle is cheaper in particular at £3.05. If you want to give dog whistles a go but don’t want to commit too much money then this might be a good starting point for you. You can hear the air coming through the whistle as you blow but otherwise it is silent. It can also be adjusted to suit your dog but not as accurate as some of the more expensive options. The RUFF dog whistle is a fancy product that comes complete with a money back guarantee if you have no luck with as well as some extra perks from RUFF themselves. 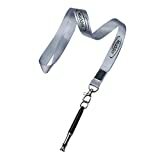 This dog whistle is adjustable and comes with a lanyard for easy carrying. Also, it’s compact and lightweight. It comes complete with instructions and AMG products are very confident in its success for you and your dog. We highly recommend this one if you’re determined to make a whistle work for you due to the hefty price tag. Want cheap and cheerful? Then the Ultrasonic dog training whistle is the one for you as you can get it for only 10p from amazon. Basic features, no lanyard and only the one frequency. Still, for 10p it’s better than a slap in the face. Want something completely over the top for your pampered pooch? How about the Acme Solid Silver Dog whistle? It’s designed for gun dogs (which a Jug quite frankly isn’t) but if you want something extremely special for your dog and have money to burn then this is the one for you. 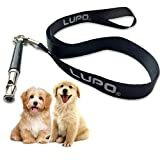 The Lupo dog whistle has been advertised more towards bark control and a repellant for bad behaviour, even though a dog whistle can be used more positively. The reviews on Amazon are mostly from those who have used it for this purpose. However, it can still be used a positive training aid just like the other whistles in the best dog whistle list. The LUPO dog whistle is a strong and rigid whistle which can withstand being dropped (it doesn’t have a lanyard) and has also got an adjustable frequency so it’s highly likely it will work on your dogs ears. LUPO also offer a 100% money back guarantee if it doesn’t seem to work for you. Lastly, it’s a steal at just £4.99 from Amazon! ✅ EASY TO USE AND COMPACT the LUPO Dog Whistle is light and compact. The perfect bark stopping deterrent. 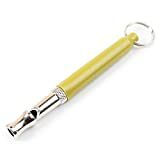 The LighterDaily dog training whistle is a lightweight, adjustable whistle which separates itself from others by being offered in different colours. Although this doesn’t affect the performance whatsoever some people like the personalisation. This handy whistle can be a gateway for new dog trainers to practice training their dog. The adjustable settings means there’s a good probability that it will work for your pooch. The additon of coming in various colours means you can match it up with your favourite colour, their harness or any other reason. Other than that, it’s more or less the same thing as our other offerings. It’s price point at time of writing is £5.99 so it may not be the cheapest but it also won’t break the bank. ★ STOP BARKING - Train your dog to stop barking or come to you. Your guests will be able to enter your home calmly and quietly while your dog lies peacefully in his bed. The dog whistle makes it easy to teach your pet a range of tricks. And it can help you enjoy walks without a leash. ★ TAKE CONTROL - Keep control of your dog even when he's off the lead, making sure he listens to and obeys you. Prevent your loyal companion from suffering unnecessary stress by giving clear commands with the whistle. The dog whistle helps you to keep your pet under control. ★ ADJUSTABLE FREQUENCY - Change the frequency to suit your pet. The dog whistle's dual protection system ensures that it stays at the frequency you choose. Unlike other, cheaper dog whistles, a two-part system prevents you from making changes accidentally. The dog whistle also enables you to give commands over long distances. ★ EASY TO USE, COMPACT SIZE - Setting the right frequency is incredibly easy. The black cap ensures the frequency doesn't change accidentally, and also provides maximum protection against dirt. This dog whistle combines a lightweight, convenient design with maximum power, for excellent results. Dog whistles are great for training your jug or any dog. It can help you keep them safe and obedient at all times, this can be a lifesaver for your dog at dangerous places like near roads if they are off the lead accidentally or have tried to run away. Dog whistles are also great to help get your dog to stop barking it’s getting disruptive, particularly in urban areas. Essentially, a dog whistle gets their attention and you can use that whistle to train your dog to come to you or any other desired action. Dog whistles operate using ultrasonic sound which is mostly silent to humans but animals such as dogs and cats can here. This makes it ideal for non intrusive training at all times during the day. They are highly effected for targeted communication with your dog. However, if your dog can hear it then other dogs can too so be aware when using it in public places where other dogs can be. A humans highest hearing range is around 20 kHz while a dog’s upper hearing range is roughly 45 kHz. This means that a frequency of between 20 kHz and 45 kHz is outside of human range but inside a dog’s range. This is why dog whistles appear to make no noise whatsoever yet dog’s ears can prick up when a whistle is blown. A good frequency for a dog whistle depends on the desired results and your dogs hearing ability. Ideally, the best frequency will be between 20 and 45 kHZ, however you can get adjustable dog whistles that you can fine tune and test to see which one your dog reacts to. However, higher frequencies may be more irritating for the dog and can be used as a punishment and a lower frequency may not bother them at all. Our advice is to keep it low between 25 – 35 kHz. Here are a few of JugDog.co.uk’s favourite dog training whistles. Dogs hearing and ability to train differs from breed to breed. Also, dog’s hearing gets worse as they get older just like we do – so it’s important to make sure you find out the right frequency for your dog – the easiest way to find out which frequency is best is to get a dog whistle that has an adjustable frequency and then it’s a case of trial and error. If you get a dog whistle with a single frequency and it’s the wrong one then it’s unfortunately going to be sent back or go in to the bin. Secondly, for the best dog whistle you should get one that matches you and your furry friend’s lifestyle, is it going to be used in doors only? If so, you won’t need an expensive and tough one but if you like to go on adventurous walks or even hiking then it’s best to get one with a lanyard and built robustly. Dog whistles are also a good thing to have alongside a quality dog GPS collar or tracker.